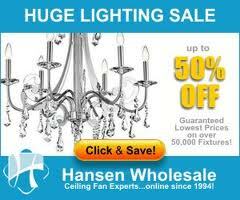 Welcome to the Affiliate Center for HansenWholesale.com. Here you can reference the program’s terms and stay up on important updates. Hansen Wholesale has now been online for over 15 years and we are proud to say that none of our competitors have been doing business online as long as we have. You can buy from us with confidence because we know what it takes to satisfy our online customers. Our years of experience dealing with online customers from all over the world at both the retail and wholesale level gives us a sharp competitive edge and has helped us grow into one of the single largest suppliers of ceiling fans, lighting, and fireplace decor on the Internet.